Descriptive checklists and rubrics are useful analysis and recording tools for evaluating children’s learning and development, as well as reporting to all stakeholders. This assignment task provides opportunity for you to investigate these tools, their application and effectiveness in early childhood contexts. 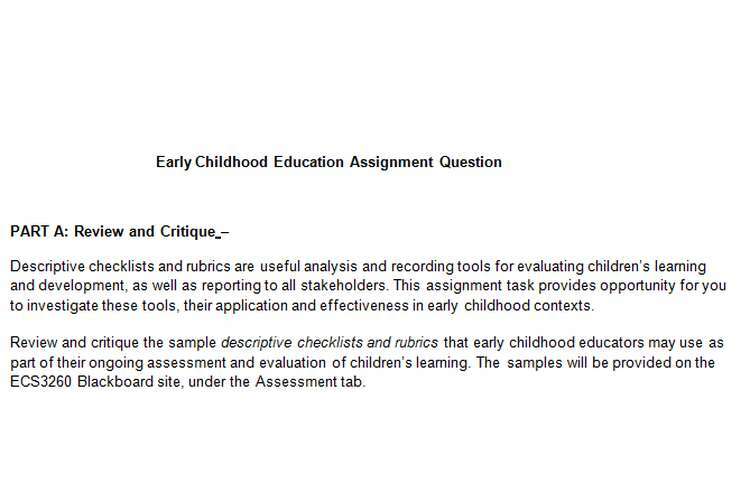 Review and critique the sample descriptive checklists and rubrics that early childhood educators may use as part of their ongoing assessment and evaluation of children’s learning. The samples will be provided on the ECS3260 Blackboard site, under the Assessment tab. A brief explanation about the assessment tool. Considerations that need to be taken into account when using descriptive checklists and rubrics to assess children’s learning and development. The extent to which the assessment tool reflects current SCSA Principles of Assessment. The extent to which these assessment tools reflect the essential components and designs principles of each method. As well as the extent to which the samples provided are or are not a good example, and what might need to be considered when using them. Your critique should be well supported with references to the course literature and/or literature independently sourced. Analysing and evaluating a Year 2 child’s achievement in writing. To do this you will prepare and apply an appropriate method of analysing and recording learning for one of the work samples provided. The writing samples will be provided on the ECS3260 Blackboard site, under the Assessment tab. (Sample A is a free choice piece completed in March and Sample B is a short story completed in September of the school year. Prepare your written paper as per the guidelines that follow. Select one of the samples. Identify the content/learning goals associated with the processes and products for writing in the Western Australian P-10 Curriculum content for English for Year Two.? Consider and select the method by which you will be able to effectively analyse and evaluate the writing sample in relation to the learning goals from the curriculum. Identify the effectiveness and issues (or potential) associated with the development and application of the analysis and recording tool you designed for this task. Relate these to your readings and knowledge of effective assessment and evaluation of young children’s learning. Explain the feedback you would provide to the student and parents (quote yourself or include any written comment on the work sample and refer to this), including how you see this feedback will contribute to the child’s future learning. Conclude by explaining how the process assisted in informing the next Planning-Teaching cycle. Identify the most important aspects to focus on to support progress for this child’s writing development.